Chris's summer drink of choice is always a gin and tonic. So Sunday, after a LONG day of housework, when he offered me a glass of white wine or a gin and tonic I sprung for the later, knowing I would win the heart of my beloved. 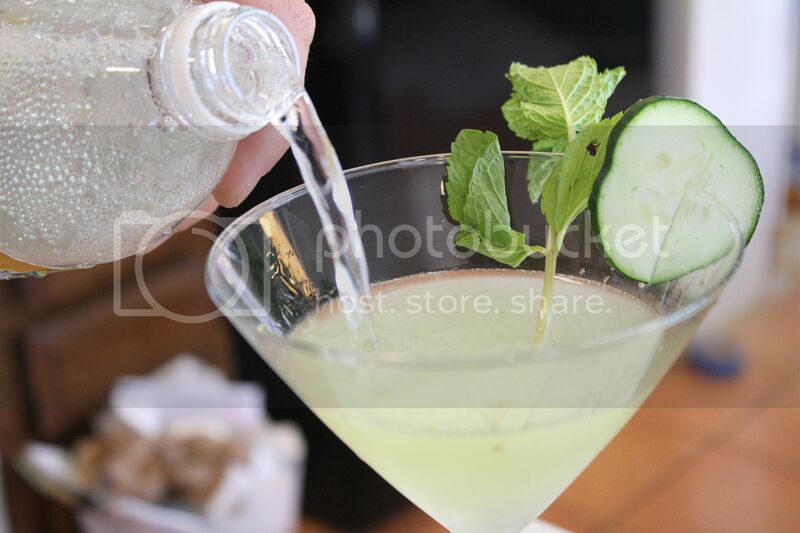 And in an effort to spice it up we added muddled cucumber and mint with a splash of lime. Refreshing and flavorful. In a shaker muddle sliced cucumber and a few mint leaves. Add a tsp full of sugar, ice, and a couple shots of gin. Shake, shake, shake. Using a fine mesh sieve to catch the flecks of mint, pour into glass of choice. Top with tonic water. Add a couple cubes of ice to keep it cool, squeeze some fresh lime juice on top, give a quick stir and enjoy! P.S. I just noticed in this picture that there is something seriously gross on that mint leaf. Eww.